Universally accessible playgrounds from Unlimited Play and Little Tikes Commercial. Little Tikes Commercial and Unlimited Play are ready to partner with your local team to create universally accessible playgrounds that children of all abilities can enjoy together. Unlimited Play is a non-profit organization that uses universally accessible playgrounds to rally community members around a higher set of values, working together to build environments where individuals on all levels can connect for a common cause. The goal of our partnership is to create an inclusive play environment that will be a point of pride for the community for many years to come — a place where all kids and adults are accepted for who they are, not what they can or can’t do. Little Tikes has developed products like the Seven Station Play Factory that enables children of all abilities to easily play together or enjoy a parallel play experience. 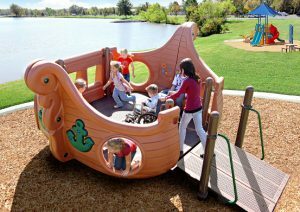 Other Little Tikes Commercial inclusive and accessible play components include the Rock’n Ship Glider, a gently swaying, wheelchair-accessible glider, and Activity Panels that allow children to express themselves while exploring imaginative play. The experts at Unlimited Play, Little Tikes Commercial and PlayPower Canada are here to help you create the best solution for your site and community. Along with our accessible and inclusive playgrounds, we offer formal training, workshops, webinars and informational kits to share successful models for universally accessible play as well as the challenges we’ve overcome along the way. For more information about the Little Tikes Commercial partnership with Unlimited Play, please visit http://littletikescommercial.ca/our-products/commercial-playground-equipment/inclusive-and-accessible-playgrounds/ or http://littletikescommercial.ca/unlimited-play/ for more details about our inclusive and accessible playgrounds. For more news on inclusive play, check out the posts below. Contact your local PlayPower Canada rep today to find out more about Unlimited Play and how we specialize in helping businesses, schools and other organizations understand the importance of inclusive play spaces and experiences. New Inclusive Picnic Table and Bench Solutions for Public Spaces Now Availa... Canada’s Best Play Equipment For Your Community—Now On Sale!